We, the Colorado Traveling Ducks, and humans have memberships to Sam’s Club. This is part of Walmart corporation that sells in larger quantities. We shop there, and often after shopping, we have a quick lunch. Today we ordered a hot dog, a soft pretzel, and a soft drink. We want to remind you that this is cheap. 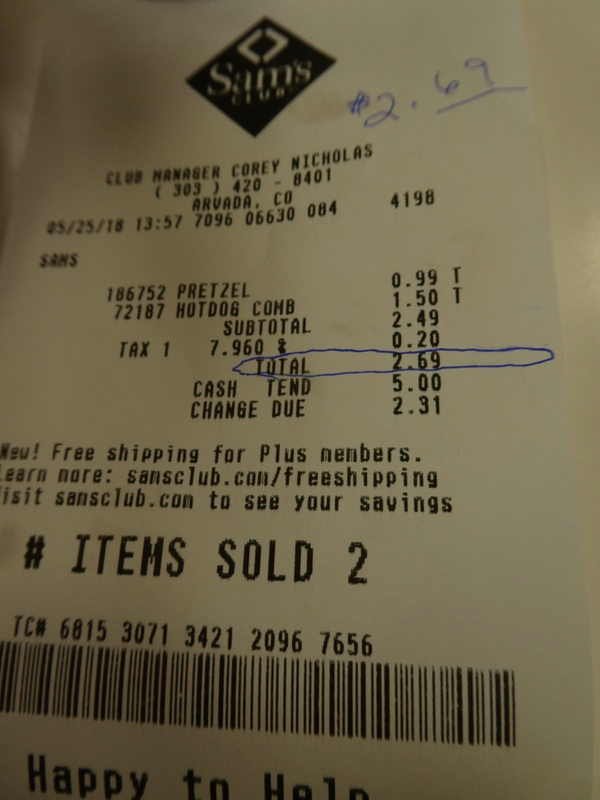 Our total bill was $2.69. This is in a western suburb of Denver, Colorado. Prices vary by location, but if you are on a road trip, eating can get expensive. Sam’s Club can give you financial relief. Of course, while on road trips, we often eat at small local restaurants, but sometimes we just don’t want much. And this much food today, was really too much. If you are a Sam’s Club member, check out the snack bar. They have 16 inch pizzas for $8.99. 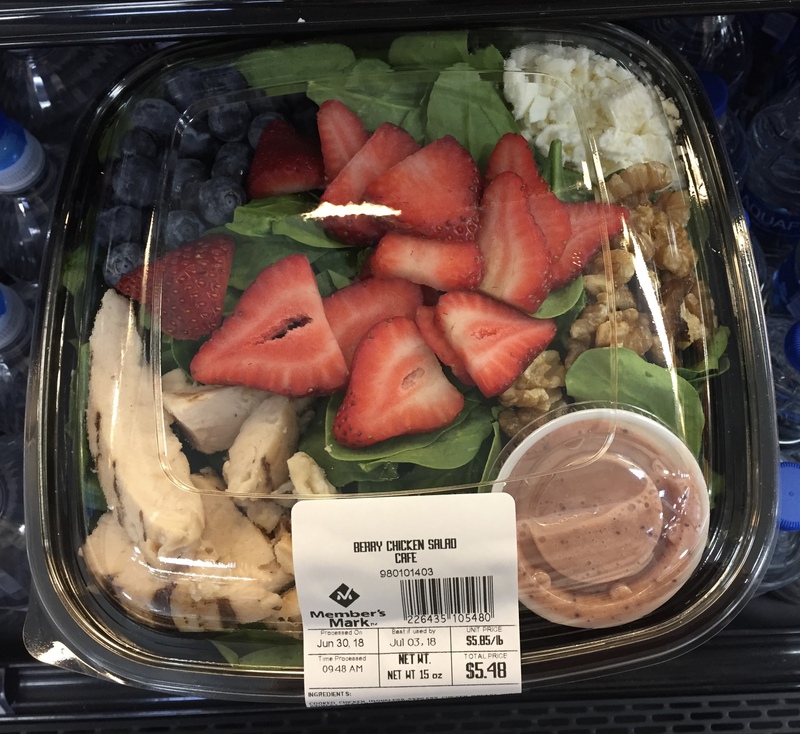 They had really great looking salads, with chicken and ripe strawberries, blueberries and walnuts. And only $5.48. Just a thought for all of us taking road trips this summer, or any time, really. 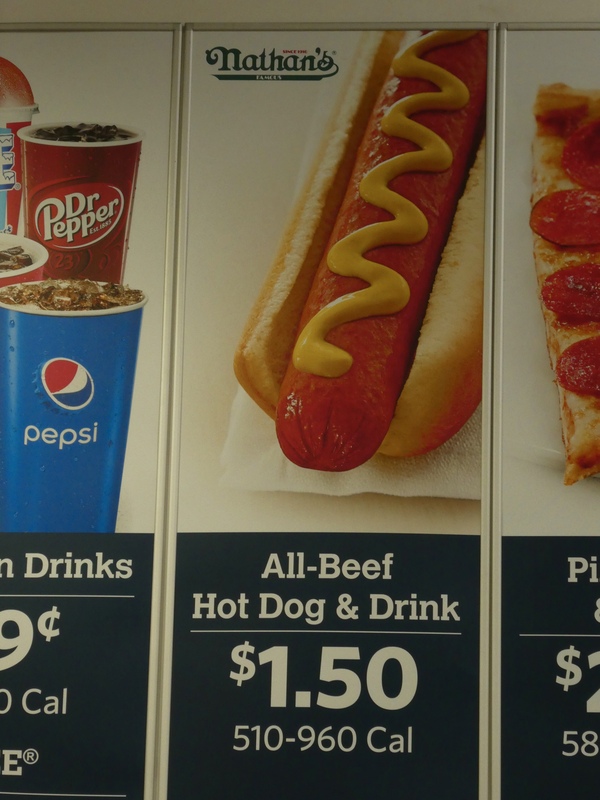 Again, Nathan’s All Beef hot dog, soft pretzel and soft drink. Nathan’s Hot Dogs. All beef and large. And free refills on soft drinks. Diameter of hot dogs is larger than a quarter. They have ice cream, also. Just a reminder for travelers. 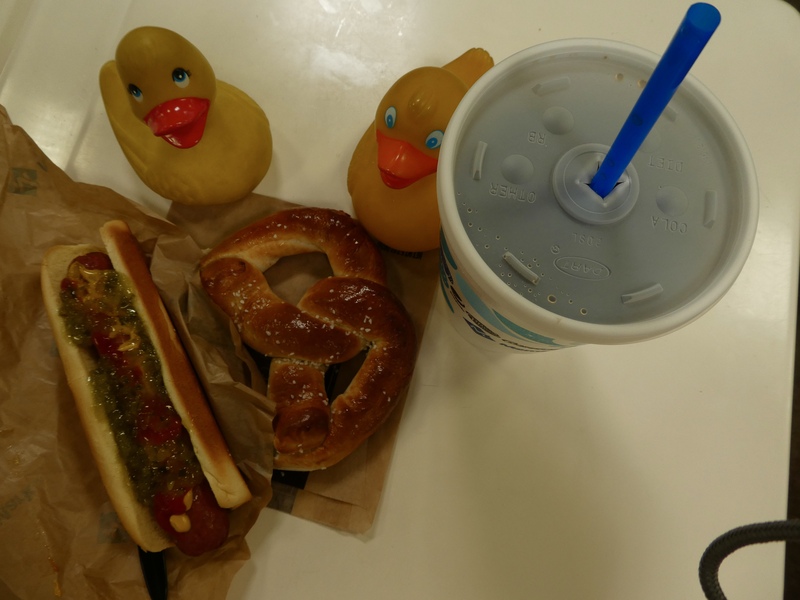 This entry was posted in Uncategorized and tagged cheaper food, Colorado Traveling Ducks, road trips, Sam's Club. Bookmark the permalink. It is a great value. And often my reward for surviving another shopping trip. A nice option for those on a road trip that want to save a little on food. It is my usual stop after shopping at Sam’s. Love those pretzels.